Hi, my name is Deborah O’Carroll, I’m a bookworm, and I’m here to talk about… movies. This is by no means an exhaustive list, since, unlike with BOOKS, I do not keep lists of all the movies I’ve watched, with star-ratings, and whether they’re based on books, etc. So cataloguing every instance of the following categories would be exhausting — and if I’m going to be honest, I’d way rather go reorganize my bookshelves again and weep over my lack of shelf space these days. Disclaimer: This isn’t to say I disliked the book versions — far from it, in some cases — I’m only saying that the movies were even better… in my opinion. It’s just a fun movie! I haven’t seen it in ages and need to re-watch it, and it’s cheesy, but… eh… I don’t care! It’s just so epic and swashbuckling and original and funny! 😀 The book is fun too, but the movie just improved on it, IMO. Basically, it’s CLASSIC and I love it. I don’t know if anybody’s even HEARD of this, but it’s a sequel thing to The Wind in the Willows, and since it was animated the same, with the same voices, as a Wind in the Willows movie I watched growing up, I just loved it as a direct sequel and felt like it fit together really well. XD When I read the book it was based on, the book was all right, but it just didn’t have quite the heart that the movie version did, somehow? I felt like the movie made sense of it and made it fit with the original better. But it might just be because it went with the version I liked to watch. 😛 Anyway, it’s a fun movie. Saw this one before reading the book, but, again, I still liked the book (especially Mr. Knightley!) much better, even though this one was fun. And before you ask, I’ve since seen two more Emma movies (after reading the book) and my fave might be Gwyneth Paltrow’s just because it’s so fun. XD But the book is still my favorite. None of the films do Mr. Knightley justice, IMO. And that’s a shame, because he’s so fabulous! I love this movie and totally need to read the book! It’s been sitting on my shelf waiting patiently. 😀 I know it won’t be… well… Errol Flynn, but I imagine I’ll enjoy the book all the same! I actually got the movie and the book at the same time at a library sale and was going to read the book first… but then I caved and just watched it. 😛 It’s kind of fun though I can’t always decide how I feel about it. XD But sometime I’m going to just sit down and read the book because it’s tiny. I just… haven’t yet. Dystopian is not my thing so I don’t know if I’ll get around to reading these. But I DID see the movies and enjoyed them in their own scary-movie kind of way. XD Just don’t get me started on annoying things about the last one. *cough* But who knows, I might surprise myself, and everyone, and read these sometime… Or at least the first couple. But maybe not. These were also surprisingly neat/interesting, particularly the first one (I think? I watched them all together so I hardly remember which is which except it gets progressively tiring the more Peter switches sides…). I also might end up reading these sometime (partly because I have a copy of the short stories about Four around, which I’m curious about) but, again, Dystopia… not my thing… and all that. So I don’t really feel like I need to. The Lord of the Rings movies are just so epic, okay? I can’t help it. I love them. Even if they do wreck a few things along the way, which we just… won’t talk about right now. (*cough*Faramir*cough*) They’re just so gorgeous! ❤ The books are still way my favorite, but I can’t help loving these too. AAHH, this movie! It’s just delightful and Scottish and yes. Alan Breck Stewart is totally different in the book/movie, but I actually love both versions of him. XD And the MUSIC and bits of story they stole, ish, from the sequel, and… I just like it a lot. I LIKE ALL THE HOLMES THINGS, OKAY? I think the book version is still my favorite — he just has so much going and is awesome — but I just enjoy all the movie versions anyway. XD They all seem to bring out different sides of him (although I’m pretty sure people tend to forget that the REAL Holmes from the books was also a gentleman… *cough*) and while the book is the definitive version for me, the adaptions are just way too much fun. So. Yes. Give me all the Sherlock Holmes. Vintage Jane Austen Mini-Reviews + Sarah Scheele Interview + Giveaway! The Vintage Jane Austen Blog Event is running this week (November 5 – 11) and features a giveaway, reviews, interviews, and more, for this lovely series of stand-alone retellings of Jane Austen’s classic works retold in a 1930s American setting. There is one yet to release, coming soon, but the other five are all available in ebook and paperback now! For the tour today, I’m excited to have Sarah Scheele (author of the Mansfield Park retelling, Bellevere House) here for a quick interview! And when you finish reading, be sure to scroll down the whole way and enter the giveaway! Sarah Scheele scribbled incessantly as soon as she could read and write. A heavy background—some might say an overdose—of literature during her childhood set writing into a loop she has yet to escape. That education in classics gave birth to several of her stories, including a rewrite of Jane Austen’s Mansfield Park for this collection. She used to wonder why Edmund and Fanny couldn’t have a better resolution?—and so she decided to give them one. Today she does many things with her time. But then she writes, which is the most important thing to mention in an author’s biography. Sarah lives on a farm in Texas with a ladylike cat and a tomboyish Pomeranian. 1. What was your favorite part of writing Bellevere House? Probably the adaptation of the Bertram’s theatricals into renting the house to various people while the Sir Thomas character (Uncle Warren) is away. I didn’t want to have the characters simply do a more recent play among themselves, so I tried to choose something that could get them into lots of trouble in the same kind of way. That area was written early and never changed much because it’s kind of a short story on its own, apart from the bulk of the remake. 2. That was a hilarious part! 🙂 Do you have a favorite book (and/or character) by Jane Austen, and why? Hmmm…Northanger Abbey, maybe. The abbey is a fascinating set and as a little kid I actually wrote my own version of Mrs. Radcliffe’s Udolpho (since I hadn’t read the original) pulling names and scraps of detail from things mentioned in NA. And for second favorite, Emma’s a really fun character. It’s hard to show those flawed people so we aren’t soft on them but we also see their point of view. I like watching Emma movies more than reading the book, though—and the opposite for NA. 3. Can you tell us a little about your other available books and what you’re currently writing? It’s funny because they’re mostly fantasy with literally no bearing on this VJA thing. Victoria: A Tale of Spain is historical, but it’s based on Snow White and started as a fantasy story. I also have a set of five short stories, called Facets of Fantasy, and a children’s sci-fi novel. Getting Bellevere finished was a pretty involving process, so I’m just brainstorming new things at this point. Currently I’m doing an urban fantasy–like a western, but with Elves and dragons. 4. Ooh, I’m intrigued! Where do you find inspiration for your writing? Instinct, mostly. I’ll admit I’m not one of those all about the craft writers, though I would say I take it seriously. But I don’t have much of a method. I just find things everywhere and save them for later. Animals, pictures, a funny line from a TV show, anything I can imagine turning upside down and then taking it from there. It’s about possibilities. Like throwing on lots of different things and suddenly you’ve got an outfit. 5. Who are some of your favorite authors? That’s a hard one because I tend to think in books, not authors. I might love one work by an author and never read—or like—another by that person again. But overall I’d say classics are always a good bet (currently I’m reading The Wind in the Willows) and for recent books I like almost anything about kids in our world who stumble on marvelous adventures. And comic stories with funny dragons in them. You just can’t beat a funny dragon if you want to get away from reality. You’re welcome. Thank you so much for having me. One of my favorite things about the Vintage Jane Austen series is how individual and unique they are, different from each other but with those unifying threads of the Great Depression era and Jane Austen retellings. They fit together as a series so well, while at the same time being vastly different, with different styles and fresh outlooks from each separate author. They’ve all outdone themselves, and through the whole varied series I have enjoyed all of the books immensely! Sarah Holman retells Emma in this novel which I believe to be her best work yet. 🙂 I loved how it was able to keep all the plot threads tightly written together in a shorter space than the original, translated into the 1930s perfectly, and all while being fun, too! Fredrick Knight (the Mr. Knightley character) was my favorite thing about the novel (with a sort of Mr.-Knightley-crossed-with-Frank-Hardy-but-grown-up sort of vibe; yay for the ’30s), along with the so-fun banter and relationship between him and Emmeline. It was fantastic. 😀 There’s a strong Christian element as well. I so enjoyed this book. ^_^ Emma fans, don’t miss this one! Coming soon… A retelling of Jane Austen’s Pride and Prejudice… set in 1930s Arizona. You can find the VJA books on Goodreads HERE. Visit these blogs during this week to find interviews, book reviews, and much more! As part of this special blogging event, we are giving away a $25 Amazon gift Card. And don’t forget to check out www.vintagejaneausten.com if you’re curious about the series. 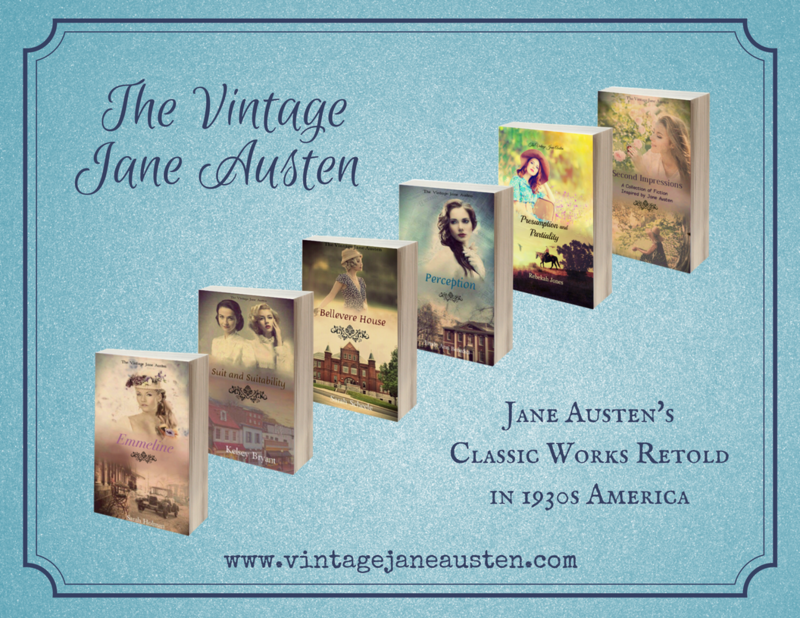 In case you haven’t heard, the Vintage Jane Austen series is a collection of novels by different authors, retelling Jane Austen’s classic works in a new setting, a.k.a. the 1930s in America. Notes: I received a free e-copy of this book from the author. I was not required to write a positive review. These opinions are my own. I find it fascinating how the Vintage Jane Austen books I’ve read so far have all been so different from each other, yet all equally delightful in different ways, and somehow fitting together as a series despite that, with their 1930s setting, Christian thread, and of course, connection to Jane Austen. 🙂 They’re so DIFFERENT but I still like them all! The mess that Grover made with his money-making scheme and how it ended. XD That entire part was such delightful (horrible) chaos and silliness, and the characters knew it, and it had me constantly on the verge of laughter. 😀 So funny! He cracked his crooked smile that made all women swoon except the ones who wanted to slap him. Faye was a fence-sitter on the subject. A wild scuffle ensued as they tried to keep Ed from destroying the article before they could read it. It’s March, 1937 . . .
And Faye Powell couldn’t be happier. After moving to live with her uncle, a wealthy banker, she’s fallen into the swing of life with his exuberant children—including Ed. The one she will never admit she’s in love with. But she hadn’t reckoned on the swanky Carters getting mixed up in that vow. Ed seems to be falling for charming, sweet Helene Carter. And when her cousin BeBe suddenly trusts Faye with a secret about Horace Carter, Faye’s in over her head. Will she betray the confidence BeBe’s given her? Will she lose Ed to Helene? The days at Bellevere House are crowded with surprises and only time will tell how God plans to untangle Faye and Ed’s hearts. BUT I’m back now, at least for the moment. 🙂 So blogging shall happen! Hurray! I have bookish thoughts for you today, and next week (June 1st) I’ll be sharing an exciting cover reveal here. So excited for both! ^_^ After that I will endeavor to return to a more regular blogging schedule for June… Hopefully. Emmeline by Sarah Holman (Emma retelling) which I reviewed, Suit and Suitability by Kelsey Bryant (Sense and Sensibility retelling), and a collection of short stories by various authors, edited by Hannah Scheele, Second Impressions: A Collection of Fiction Inspired by Jane Austen. Ellen Dashiell, the main heroine of the story, was also so well-written and I really liked her. 🙂 She felt so REAL to me. I felt bad for a lot of her struggles and cheered her on, and she was just a great heroine—rather inspiring, actually! I’m not saying who, but I was taken off-guard by how CHARMING and likeable a certain character was (anyone who knows the Sense and Sensibility story will pick out who I’m talking about). He was well-written enough that I found myself liking him at first even though I knew who he would turn out to be! I did really dislike him as time progressed and as his situation dictated, but the fact that I liked him at all to start with… I was impressed with that. There are many things I loved that I can’t directly address due to spoilers, but suffice it to say that the romances (not telling whose! ;)) were at times painful (as expected) but ultimately SO SWEET and rewarding and lovable. ^_^ Sooo many mixed emotions on the ride and I enjoyed it all so much! ^_^ My favorite pair of all, especially. They are the sweetest thing, poor darlings, and they go through so much but it’s all so worth it and their patience and quiet goodness is rewarded and it’s so SWEEEEET! ❤ I’m just really really happy with the entire plot related to them. 😀 JUST YES. Their parts were so fun and I just… I so enjoyed reading about them! I’m ever so pleased that they got more focus than their original counterparts, because they totally deserve some more focus and this time they get it! ^_^ But but but much cuteness of two sweet love stories. ^_^ BASICALLY THEY WERE PERFECT. The mystery surrounding their father’s criminal accusations is almost as hard to solve as the many puzzles springing on their hearts. Canton, Ohio, 1935. Ellen and Marion Dashiell’s world crumbles when their father is sent to prison. Forced to relocate to a small town, what is left of their family faces a new reality where survival overshadows dreams. Sensible Ellen, struggling to hold the family together, is parted from the man she’s just learning to love, while headstrong Marion fears she will never be the actress she aspires to be. When a dashing hero enters the scene, things only grow more complicated. But could a third man hold the key to the restoration and happiness of the Dashiell family? Since becoming an Austenite as a teenager, Kelsey has dreamed of writing a book in ode to Jane Austen. Sense and Sensibility is one of Kelsey’s favorite novels and Elinor Dashwood is her favorite book character, so it’s easy to imagine her ecstasy as she was writing Suit and Suitability. This is her first published historical fiction work; she has also published two YA contemporary novels. Kelsey lives in Central Texas with her family, where she’s also a copy editor, a martial arts instructor, and an avid student of the Bible.